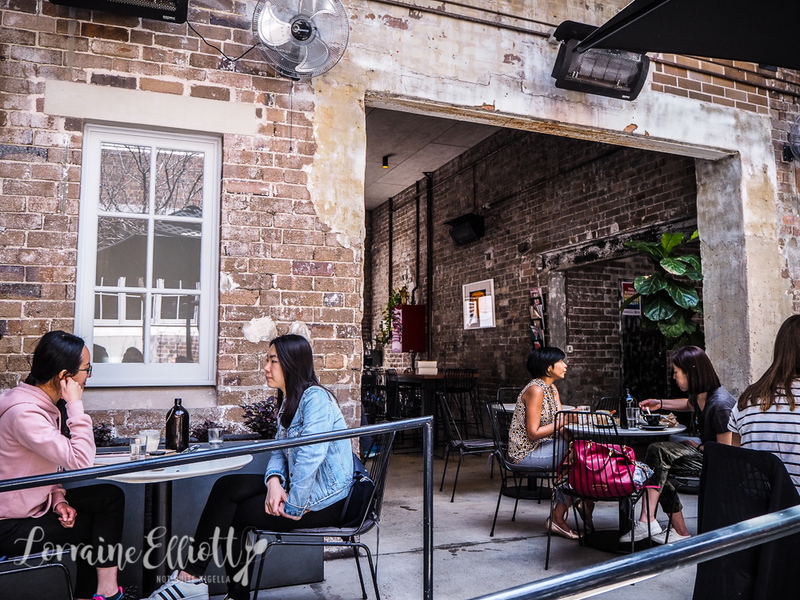 Down a small street in Redfern lies a cafe with a spacious, sun dappled, dog friendly courtyard. 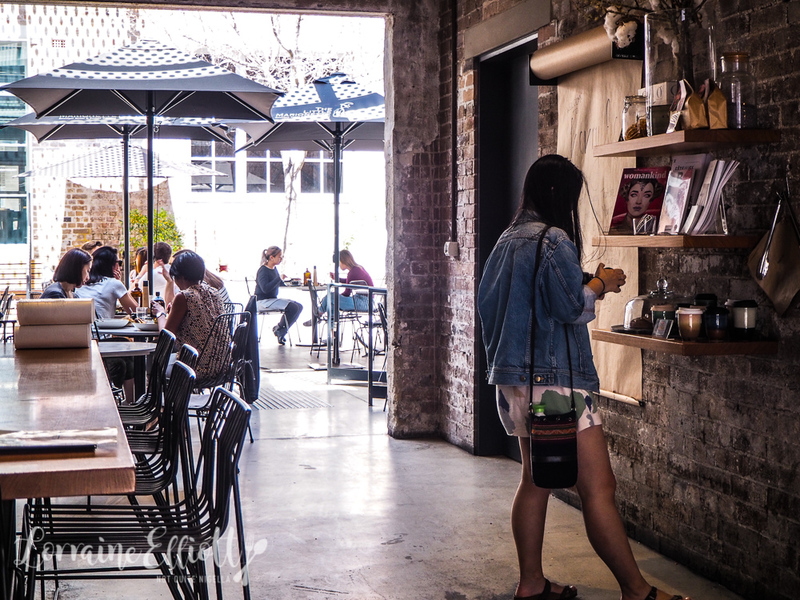 The food menu offers items with names like "The Proud Girl", "The Vampire's Wife" and "The Mercy Seat" and with a rainbow range of specialty lattes. I'm relieved when I walk into Henry Lees. 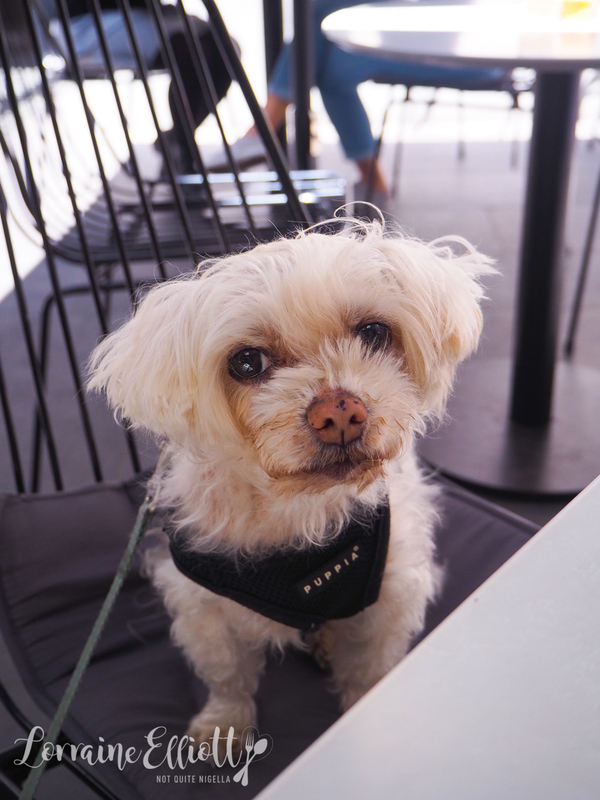 You see someone had told me that they were dog friendly but sometimes that means one or two tables. 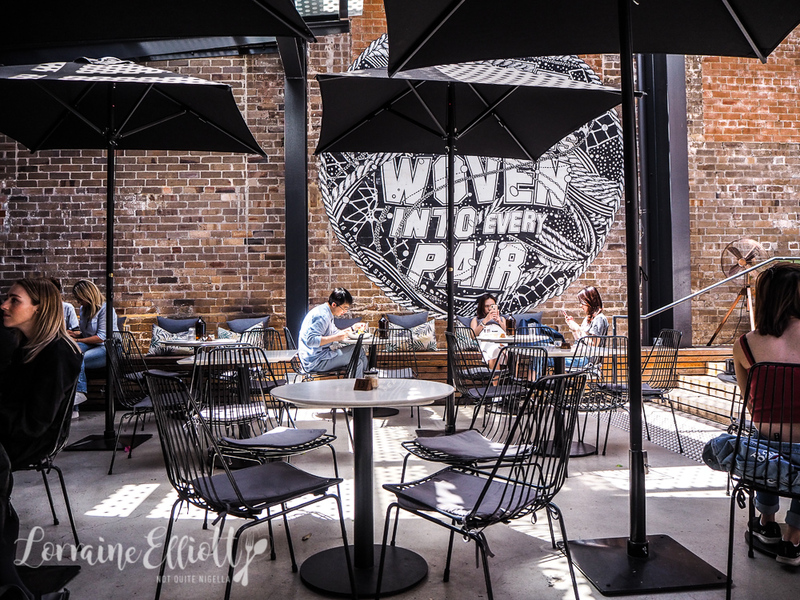 The entire cafe of Henry Lees is outside in a courtyard. It's a popular place and Sammie nabbed the only free table available. Service here is very friendly and attentive and we order with our lovely waitress. Mochi curls up and snoozes for much of the lunch. While Sammie remains suspicious of purple drinks and matcha lattes, I gravitate towards flavours like this. And taro or purple sweet potato in a drink? Yes, it's a strongly purple drink (read: your lips, tongue and teeth will be stained purple) and it is served unsweetened so you can sweeten it to your own tastes. 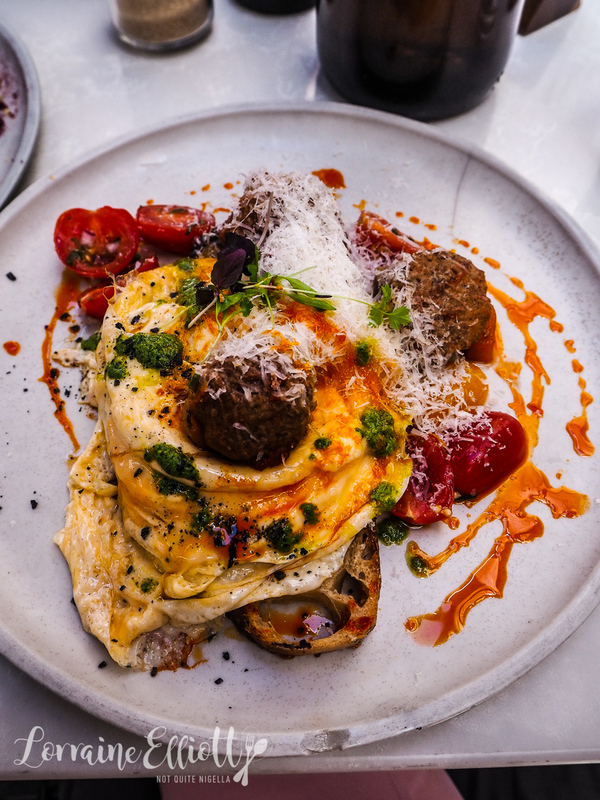 Everything on the menu has a quirky name and The Proud Girl is thin grilled white sourdough toast halves with meatballs in tomato sugo with pesto scrambled eggs, parmesan cheese snow and zaatar. It makes for a flavoursome meal and I must admit that I wish I had a bit more sourdough bread for the eggs and meatballs. 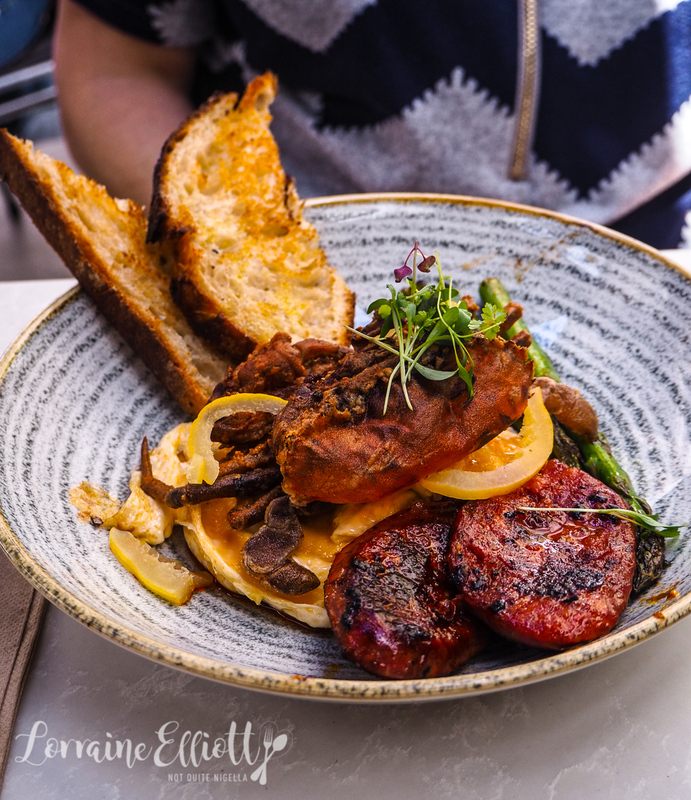 I think this one was both of our favourites of the savoury mainly because if you add chunks of chorizo to anything chances are I'll love it. There's also a crispy soft shell crab, grilled asparagus, preserved lemon, kale and chilli via paprika and Aleppo chilli oil. I don't even think it needs the deep fried soft shell crab, just some extra chorizo or halloumi would do this perfectly. Sammie is on the 5:2 diet so she can't have sweets but you know me right? I order The Gloaming which is a croissant French toast. 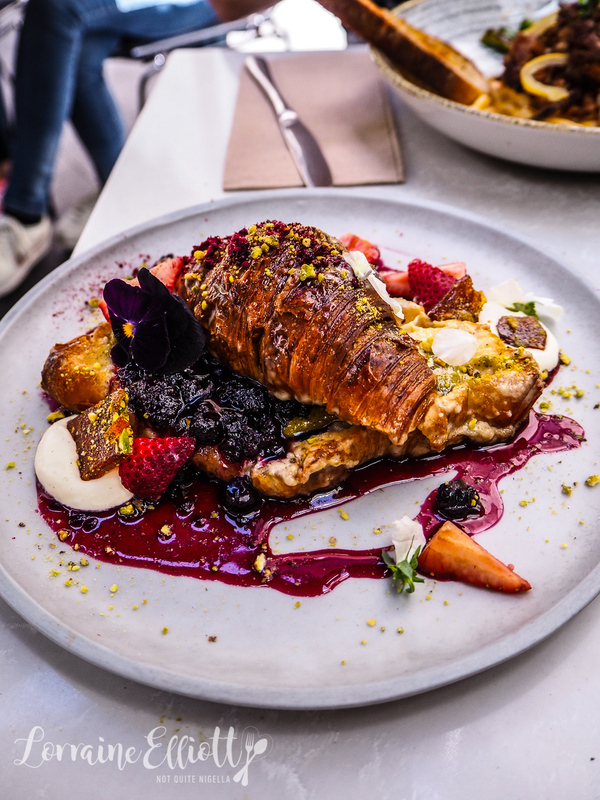 A croissant is split in half and comes smothered in divine pistachio butter, a vanilla, blueberry and Chambord jam with dabs of chantilly cream, blackberry dust, pistachio praline, blackberries and maple syrup. And for someone who only intended to try some I made fast work of this mainly because I adored that pistachio butter and the custardy butteryness of a croissant French toast. And Mochi even got a tiny bite! 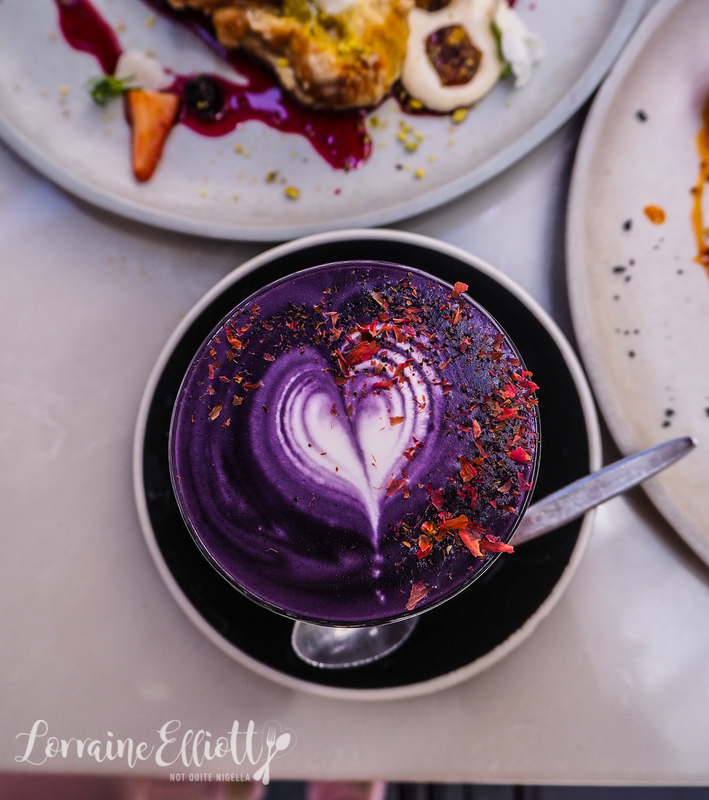 So tell me Dear Reader, how do you feel about taro and matcha drinks? Have you ever been on the 5:2 diet?